LoGo Trikes, based in Western Australia, produces what is probably the best sports touring adult recumbent tadpole tricycle available today. 3·2·GO was the original, exclusive USA importer for these solid, high quality cycles beginning in 2002. LoGo Trikes is currently expanding its US dealer network, and new trikes are now available over here, with a base price of $3250. All LoGos come standard with the most comfortable seat in this market, superb disc brakes, top-quality high pressure tires, and sealed cartridge bearings in all critical applications. LoGo trikes are the only cycles we offer via telephone, internet or mail orders sales; all our other trikes are sold only to local buyers. We don't just sell LoGos; all the 3·2·GO family rides LoGos as our personal trikes of choice, and we strongly recommend them as an excellent choice for your three-wheeled enjoyment, from day trips to fully loaded long distance touring. WE LOVE LOGOS! Catrike currently offers nine models, one of which has only two-thirds of the normal complement of wheels. The colorful Cats are built in Florida with very stiff aluminum frames, priced from $1350 to $2750. These tadpoles probably have the highest strength to weight ratio of any trikes in standard production, and have an excellent reputation for performance and durability. Their low-priced Trail model, with optional bar end shifters, has been one of our most popular trikes, combining outstanding value with excellent all-round performance and wide-range gearing suitable for Ventura County's toughest trails. Other models cover the full range of rider size, from the smallest Dash – which on a scale of one to ten our granddaughter rates at least 15 – to the Expedition model, which is one of the roomiest tadpoles available for full-sized adults. Light weight, stiff strong frames, bright colors, low prices, lots of options and accessories, a huge range of sizes and styles – there's a lot to like about what are, hands down, the best sports touring trikes made in the USA! The new Trident Stowaway was added to our product line in the Spring of 2010. This folding tadpole offers optimal portability along with the most impressive set of standard accessories available in the market. There are two models, priced at $1425 and $1725, including the fenders, rear rack and lights that can add hundreds of dollars to the price of other trikes. Stowaways are available with either red or blue powder coated chrome moly frames and components of much higher quality than other trikes anywhere near this price range. 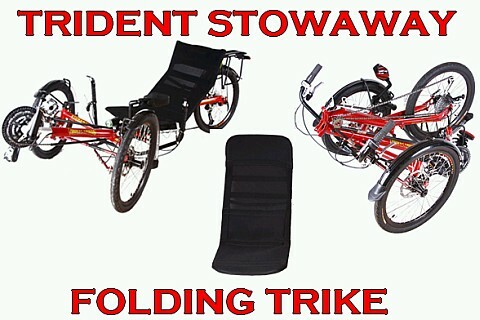 The Trident Stowaway is an excellent value in a folding tadpole tricycle.